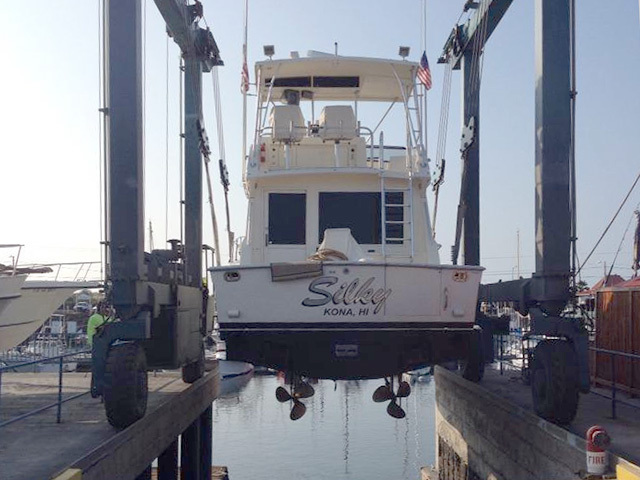 How to fine tune your vessel to tease up big marlin..
After a thorough tune-up, the charterboat Silky started raising more fish, including a 752-pound blue marlin that put Capt. John Bagwell atop the Kona leaderboard. Just a coincidence? If so, it's a coincidence common to many repair jobs done right. Photo courtesy of Silky Sportfishing. Capt. Dale Leverone marked this big blue marlin on his sounder unit about 20 seconds before the boat's engines teased the fish up to the surface. Regular tunings are critical for more reasons than one. Something as simple as a squeaky bearing, out-of-line driveshaft, or bent prop could blow up into expensive problems -- but none bigger than dragging down the fish count. The Kona charterboat Silky was on a hot streak. Capt. John Bagwell and his crew had won the 2013 Skins Tournament with a 645-pound blue marlin and followed it up a few weeks later with the Henry Chee Award in the Hawaiian International Billfish Tournament (HIBT). The HIBT recognized Bagwell and his deckies for scoring the most points during the five-day event, and Bagwell's winning total included a 588-pound blue marlin that boosted the Old South Marlin Club into the winner's circle. Later that year, however, Bagwell began to wonder if his 45-foot Viking had lost some of its competitive edge. He began to think the engines didn’t sound right. Perhaps the fish had also detected something discordant because the boat wasn’t getting as many blue marlin bites as before. So they hauled Silky out and worked on the hull, the twin 485 Detroit Diesel engines, injectors and props, re-tuning the boat until it was as smooth as its name. Something as simple as a squeaky bearing, out-of-line driveshaft, or bent prop could blow up into expensive problems -- but none bigger than dragging down the fish count. “Harmonics make a huge difference in whether fish will come to the boat to look at the lures,” Bagwell says, and sure enough, back in the water, the Silky started off 2014 with a 753-pound blue marlin, which topped the Kona list for two months. In April, Tobin Hudgins took over the helm when the boss was out of town and caught Kona’s largest striped marlin of the year to date. In between, Silky was releasing a steady stream of billfish just as before. Silky’s dry-dock success is not uncommon. You will hear many stories from skippers with similar accounts of improved catches after engine work. Can it really be true that some boats attract fish better than others? Do boats really attract fish? While trolling off Kona, Hawaii, fishing vessels often mark marlin on their recorders as the fish swim below at 20 to 30 fathoms, and marlin spotted deep take 10 to 20 seconds to swim to the surface and investigate the noise. When this doesn't result in a strike, crews mark the spot on the chartplotter and troll over the mark again to give the fish another chance. Every week we hear stories from skippers who have marked fish down deep and brought them up successfully for a solid strike and memorable catch. What brings them up? It has to be the sight and sound of the boat and the commotion of the wake. Over the years, Hawaii trollers have noticed a certain pattern to the strikes on lures in their spread. The lures closest to the boat usually draw strikes from the biggest fish. By contrast, the “stinger” lure at the back of the spread usually entices the smaller, more timid fish. As a result, big-game trollers generally position their largest lures just a few waves back from those attention-getting props. At times, the engine sound might even signal a safe zone. On one occasion, Capt. Chuck Haupert was fishing a Kona FAD when he noticed two large shapes snuggling up against the hull of his boat Catchem-1. When they rolled on their sides and flashed their colors, he realized he was looking at two of the biggest yellowfin tuna he had ever seen. What were they doing so close to the boat? 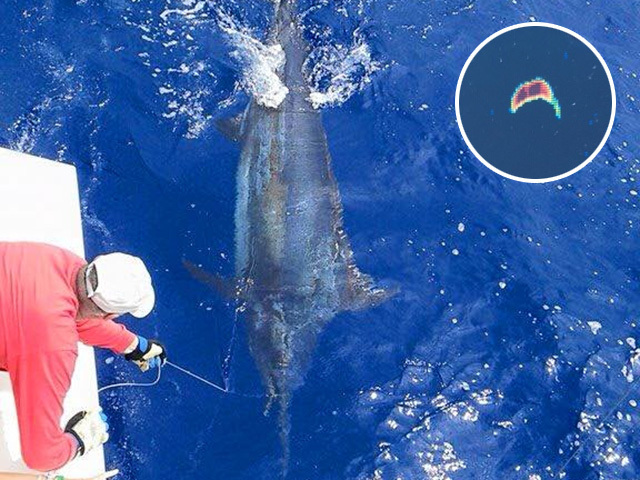 The very exciting answer arrived in the form of a huge blue marlin, which Haupert estimated at over 1,000 pounds. None of the three big fish seemed at all upset at the sight and sound of Haupert’s 30-footer. The boat was the main draw. Given a choice between catching the tuna or trying for the grander, Haupert went for the yellowfin. Indeed, they were close enough to free-gaff and haul aboard before they could get their heads down. Thinking back on his decision to go for the tuna, Haupert thinks he might have stuck a hook in the nose of the smaller tuna and used it to bait the grander. All of the game fish were drawn to the boat's engines, but if engine noise is so appealing, which tone works best? Mark Barville is a champion spearfisherman and conservatory trained musician who sits on the bottom and listens to the sounds of boats that go by overhead. He watches the behavior of any fish that might be swimming nearby and occasionally notes some interesting responses. 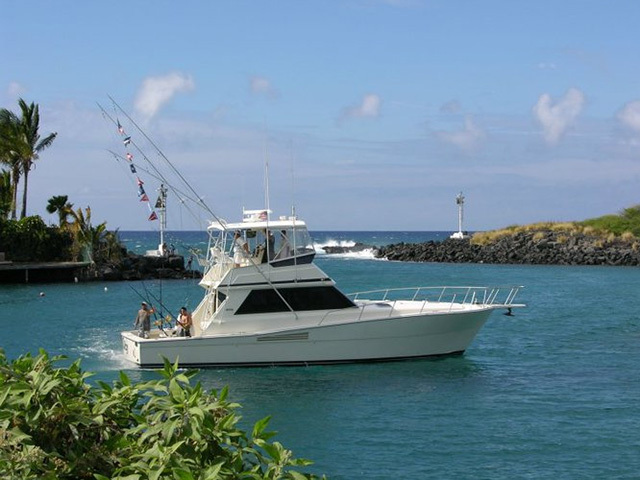 Read more about how to fish Hawaii from author Jim Rizzuto at FishingHawaiiOffshore.com.